Log into the Admin of your site. On the left side of your Screen Click on Posts in the Admin Menu. That will open the List of Blog Posts you’ve made. Click on Add New, either below the Posts menu item on the left side of your screen or besides Posts toward the top of the screen. That will open the Posts Editor. The first box you’ll fill in is the name of your Blog Post. Please note, these names will need to be unique. You cannot have duplicate blog post of the same name. Once you type the name of your post hit enter/return. Here is what the page will look like once you enter your blog post name. In the example I used the name ” Your New Post “. Right below the title you’ll see something labeled: Permalink. This Permalink is the URL for this specific blog post. If you want to link or share directly to this post, this is the link you’ll use. It is automatically created after you enter your blog post name. If you ever feel the need to change the name of your blog post, be sure to change the Permalink too. You’ll simply click the “EDIT” button, at the end of the Permalink. This will allow you to change it to match the new name you’ve given your blog post. If you don’t change the Permalink, then the url for this post will use the old name. You can also grab the “shortlink” a smaller version of your blog url for use around the internet and social media. It can be really nice when tweeting or sharing in text messages. Just click on the “Get Shortlink” button to get a copy that you paste where ever you need it! Below the Blog Name, you’ll see the Visual Editor, the area where you add your blog content. You can see in the example below that we’ve added some paragraph text, a link, and a media image. Your tool bar at the top of the visual editor will allow you to format your blog post to make it look just like you imagined. Hovering over the icons will cause a tool-tip to appear that tells you what that button will do. As you can see below we are hovering over the “Paste as Text” button. If you’d like to know how to add media, such as pictures or documents read this tutorial: Adding Media to your Site. Once you are satisfied with the content of your blog post. You’ll need to set the settings for your blog post before you publish. These settings are located in the boxes to the far right of your screen. At the very bottom of the settings boxes you’ll find the box labeled Featured image. Within the box you’ll see a link “Set featured image”. Click on that to open the media file. You’ll be able to choose your featured image by clicking on the image of your choice and then clicking the “Set Featured Image” button, located in the lower right hand side of your screen. That should close that window and you’ll see the image you choose inside the Featured Image box. If you want to change the Featured Image. Click “Remove Featured Image”. Then click “Set featured image” and do the previous steps again. 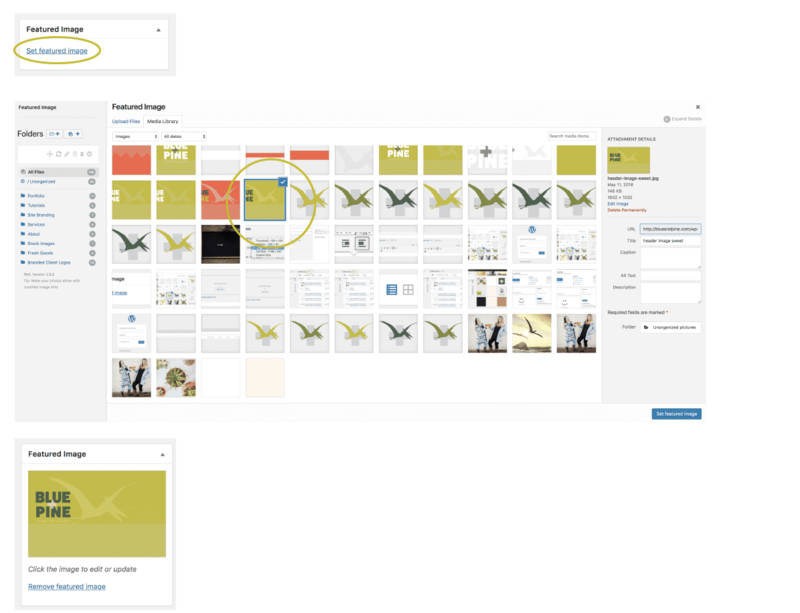 Featured Images will often need to be the right size to look nice on your site. Featured images are the ones that are used on your home page, in the blog archive, and are often the image of choice for social media when you share your links. If your images need to be a certain size, Bree + Jess will have let you know the size during your website training. If you can’t find that info, please send us a message and we will share the right sizes for your images. After all, images are one of the most important aspects of your site. If you think of blogs like books, then you can think of Categories like chapters and Tags like an index. You’ll want to set both of these every time you create a Blog Post. Categories are listed within their box. You can filter your categories by clicking on either All Categories (and scrolling) or clicking on the tab “Most Used” to show the ones you use most often. When choosing a category it is best to choose only one. Pick the best one. If one you need doesn’t exist you can create a new category by clicking on “+ Add New Category”. You’ll simply type the name of the category and click the “Add New Category” button. It will then be available to check on this and any other blog post! 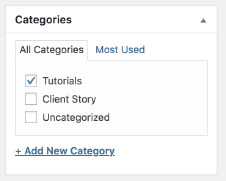 If you want to create sub-categories, you’ll nest them under one another in -Parent Category- when you create a new Category. If you have the Parent Category set as Vegetables, you may want to add three sub-categories, Carrots, Cucumbers, Tomatoes. You’ll add each sub-category one at a time. Before you add the category you’ll click on -Parent Category- and choose Vegetables. Then click “Add” to add them to the tags. If you want to choose from the most used tags, click the blue words at the bottom of the Tags box. It will list a few tags that you use often. You’ll then click on the ones you’d like to use. 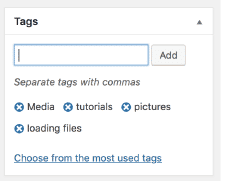 Unlike categories, you can use as many tags as you’d like. The last box you’ll visit before your Blog Post goes live (or get’s published). 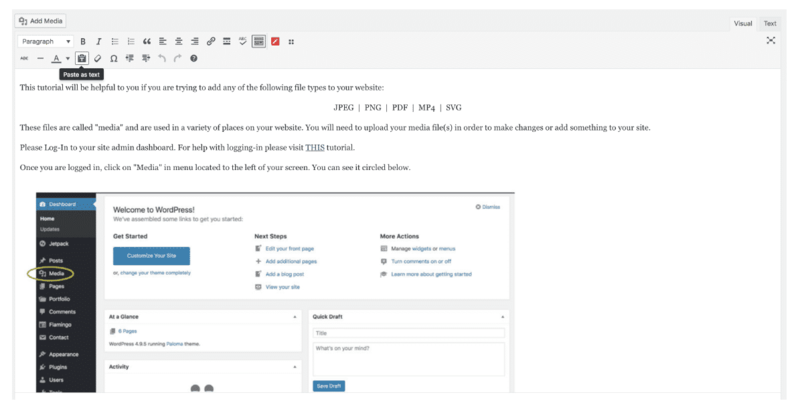 Here you can set a variety of settings for your blog post. You can publish, save a draft, make it password protected, and schedule or post date the blog post. 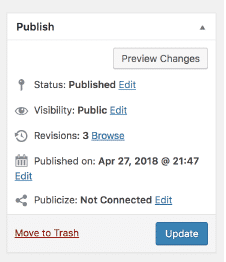 You can also preview your changes as you work before you publish it. Once you click “Publish” the blog post is available on your website for the public to view. So be sure you save your draft and use the “Preview Changes” buttons until you are ready for the blog to go live! I’ll go over each section of this box below. You can edit all these areas by clicking on the blue Edit link following each section. Status: This section will tell you the status of your blog post. The options are: DRAFT, PUBLISHED, PENDING REVIEW. A new post will say Draft. A published post will say Published. Or if a friend is writing for your blog they may only be able to submit their post for review. If you accidentally publish early, you can change the status back to draft here, to remove it from your live website. Visibility: This section let’s you know who can see your site. The options here are: PUBLIC, PASSWORD PROTECTED, PRIVATE. Public means everyone who can access your site can see it. Password Protected means you’ve added a password to this blog post. Only those with the password can access the content to this post. Private, means only you can see the post when you are logged in to your admin account on the site. Revisions: This section is like a major undo button. If you publish or save a post and then realize it is not at all what you wanted and you want to go back to the last time you saved you can with this button. Click Browse, and you’ll be able to scroll through and choose the version of the blog post you’d like to! What a relief, right? Published on: This section lets you see the date you published the post. It also allows you to change the date of publishing. This is handy if you are a go getter and would like to schedule your posts to come out at a certain date and time. It is also handy if you’d like to post date a post. Perhaps you’ve moved a post over from somewhere else and you want the original publish date to be displayed and not today’s date. In that case you’d be able to display the correct date. Publish – Share your post with the world! Once you are satisfied with all of your edits, have the best featured image set, crafted the perfect tags and categories, and have set all the possible publish setting you are ready to go live. All you have to do is click “Publish” or “Update” if you are fixing it up! Happy Blogging!